If GGG-Canelo II doesn't happen next, which of the names De La Hoya mentioned would you like to see Canelo fight: Jacobs, Charlo, O'Sullivan, Jacobs? If GGG-Canelo II doesn’t happen next, which of the names De La Hoya mentioned would you like to see Canelo fight: Jacobs, Charlo, O’Sullivan, Jacobs? As fans have read, the rematch between middleweight arch-rivals Gennady Golovkin and Canelo Alvarez is kind of looking doubtful for this coming September; as Oscar De La Hoya more than made clear when speaking with RingTV.com on Thursday – The Golden Boy going as far as to say GGG is “scared” and “doesn’t want to fight Canelo”. That is of course hugely debatable but Oscar says he is “moving on,” looking at reaching out to a number of name fighters (some big names, some not so big) as he tries to find a suitable fight for Canelo for September – when the Mexican star will be eligible to fight and is determined to fight; whoever his dance partner is. The names De La Hoya listed as those he will be calling are: Danny Jacobs, Gary “Spike” O’Sullivan, Billy Joe Saunders and Jermall Charlo. So which of the above would have the most fan appeal as far as who Canelo’s “comeback” foe is? Does the Mexican star need a tune-up type fight, or is he capable of going straight back in with an elite fighter, a champion? Jacobs, 34-2(29) was last seen having his hands full in an exciting fight with a determined Maciej Sulecki, winning a 12-round UD. Jacobs of course pushed Golovkin very hard last March and the chance for Canelo to top the performance GGG handed in would prove to add to the promotion of Canelo Vs. Jacobs. Saunders, 26-0(12) and the reigning WBO middleweight champ, has to get past countryman Martin Murray in June, but the slick southpaw has repeatedly called out both Canelo and GGG. Would Saunders be too tricky a proposition for a possibly rusty Canelo? Charlo, 27-0(21) was last seen crushing a decent fighter in Hugo Centeno Junior and the Texan very much wants the big fights. 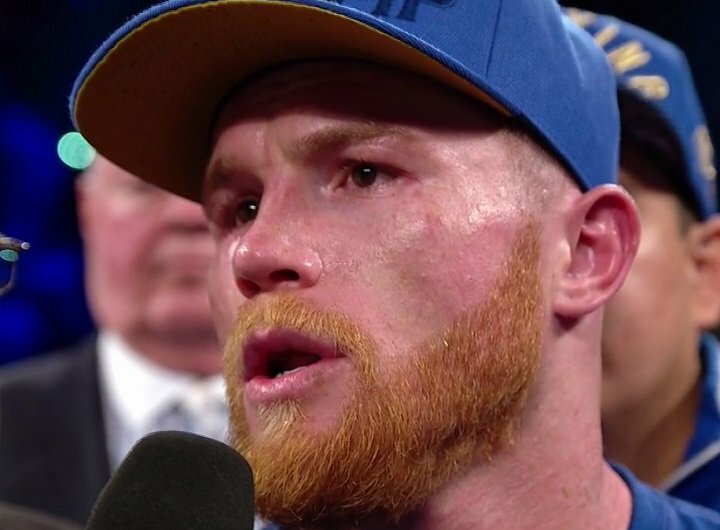 This one will likely top the list in the opinion of who most fans would like to see Canelo rumble with upon his return to action. But would this match-up also prove way too risky for the Mexican star? O’Sullivan, 28-2(20) has had his name linked to that of Canelo’s before now and the Irish warrior could get his chance soon. Last seen stopping Berlin Abreu and now winner of his last six, “Spike” might be looked at as the “safest” of the four names De La Hoya listed as potential foes for his number-one fighter. Charlo looks the tastiest proposition by far, but the smart money says O’Sullivan will get the gig. Agree? Previous boxing news: To (Legally) Stream or Not To Stream That Is The Question? You are here: Home / Boxing News / If GGG-Canelo II doesn’t happen next, which of the names De La Hoya mentioned would you like to see Canelo fight: Jacobs, Charlo, O’Sullivan, Jacobs?